It wasn’t easy to find the exact right punch for Thanksgiving. Fruity? Yes, but I wanted it to taste like the holiday season. This exquisite Holiday Champagne Punch was perfect. And while you may be tempted to omit the nutmeg, it adds a delicate spice and is transformed by the mixing of flavors. Use the best gin and champagne possible. 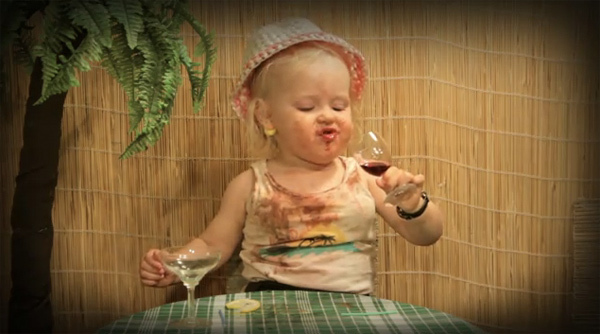 Further proof that toddlers are tiny drunks without the alcohol comes from this adorably funny short film. This is just a portion of the short “Las Palmas” directed by the handsome puppet making Swede, Johannes Nyholm. Thank you, Brandon for the link. Thank you, thank you, Jessica. If any broad can class up a Jello Shot, it’s her and she did so with these Birthday Bourbon Smash Jelly Shots. Shaun claimed he tasted peanut butter, and before we could roll our eyes at him, I realized he was right! 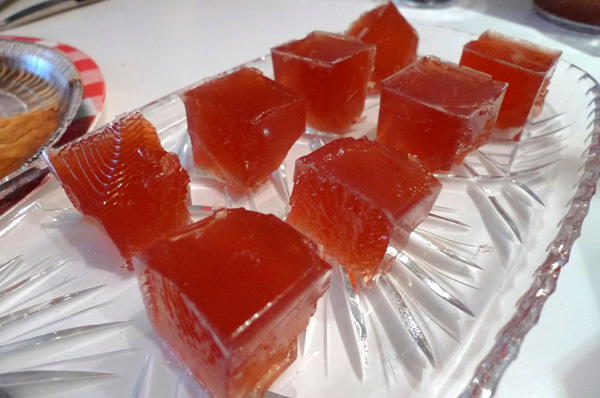 They are like pb&j for adults… or at least adults that partake in jello shots. 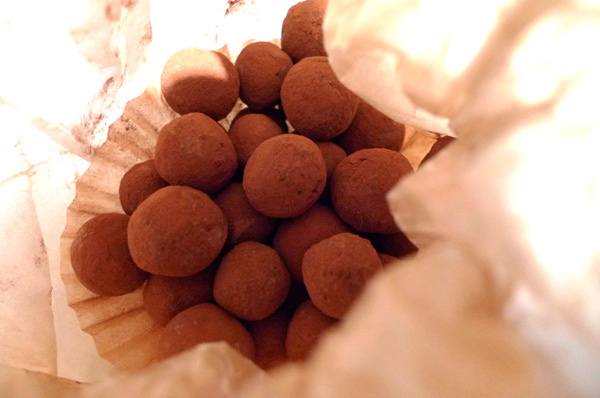 My friends are awesome and always bring great goodies to dinner parties, but Astrid really outdid herself with these Peat Scotch Truffles. She used this earl grey recipe as a basis but used the Peat Scotch in place of tea. It’s a very sophisticated taste, that is at once chocolatey and boldly smokey (the signature flavor of Peat Scotch). It’s almost jarring at first taste, then quickly becomes addictive. Having a packet of these in the fridge is proving to be dangerous. Dangerously delicious. 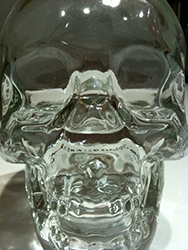 At first, everyone thought Dan Aykroyd's Crystal Head Vodka was some sort of viral video joke, a lead in for some new movie – possibly even the latest Ghostbusters everyone's been excited/nervous about… but we soon realized, once it hit liquor store window displays, that the product was very real and makes for one hell of a keepsake. While the vodka itself came in second to our own non-scientific blind taste test (the cheap Polish potato vodka, Luksusowa won hands down) it's not bad and the container is awesome. If you're an Aykroyd fan (and who's not?) 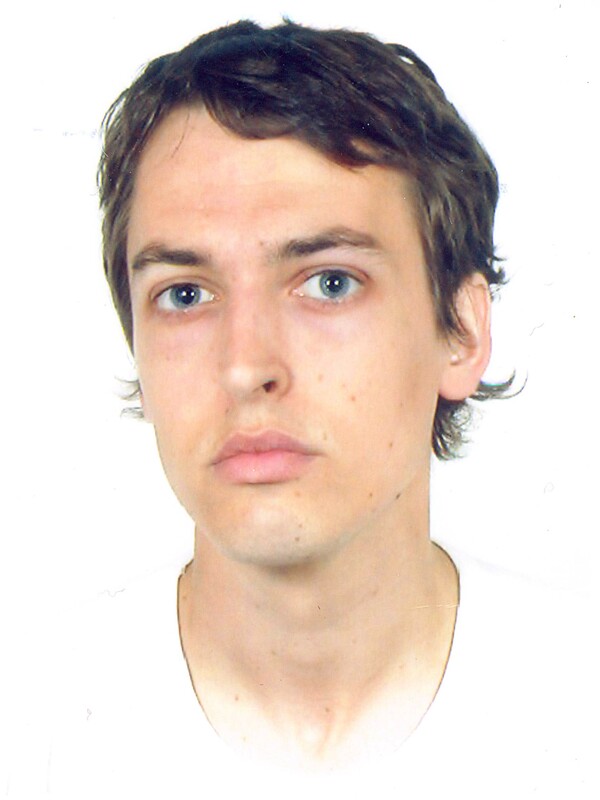 you'll also be pleased to hear that he is speaking about Ghosts and Other Creepy Things at the 92nd Street Y tonight. Strangely enough, my friend Tony, who rarely drinks, has developed a taste for Long Island Iced Tea: a cocktail that not only includes vodka and rum but tequila, gin and triple sec to boot. On a recent visit, Tony ordered it in a beer bar, which resulted in a pint glass full of beer-bar-caliber booze, but at the home of our friend Shaun, who can occasionally be a bit of a booze snob, it meant nothing but top shelf all the way. 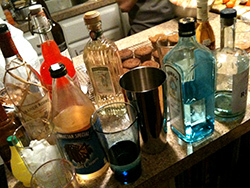 With rare vodka from Iceland and tequila from even further, the drink was rocking and I couldn't help but snap a photo of their counter full of potent potables that make up this crazy concoction. Funnily enough, the only ingredient that Shaun didn't have was Coke, so he substituted high grade cream soda, which added a yummy dash of vanilla to the drunkenness. I was so pleased with my superb old fashioned at Rye that I made a note to myself to buy a bottle of Old Overholt Rye as soon as possible. It makes for a pepperier drink and costs a mere twenty dollars a bottle – (I found it at Uva in Brooklyn). It's one of the few straight rye whiskeys available. 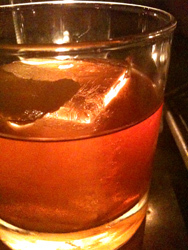 Rye in general faded away largely during the prohibition. Lucky for us, it's making a comeback. My friend Laura, who recently packed up and left for LA (boo!) recently learned that her cross country movers refused to pack any opened bottles – I've never been so grateful for arbitrary rules because it meant that we all got to raise a glass at her going away soir?e of this very, very fine single barrel bourbon. Their site explains what “makes our bourbon so special” and it includes setting the standard of single barrel bourbon (in the 1800's they were the first to even conceive of a single barrel process), evaluations from Master Distillers (“true artisan, the master distiller is the crucial element in the bourbon making process. 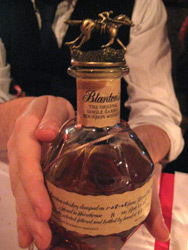 Each brand of bourbon has its own recipe, closely guarded by the master distiller”), a panel of professional tasters(!) and hand packaging. It's so fancy that each bottle is hand-numbered with the exact barrel and date it was made. Plus, it's stopped with an adorable little pewter horse and jockey, like a little toy for rich boys that love the races. 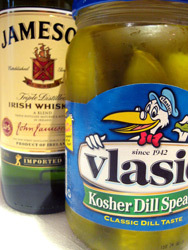 There was a time when I got really upset at Jim for throwing away my pickle juice. I like to sip it when the mood strikes me from time to time and Jim learned the hard way that I hate little indulgences being taken away from me. I never imagined my weird obsession would be paired with my less weird obsession, Jameson but that's exactly what I found at Savalas the other night. Just ask for the pickle house special and an enthusiastic bartender will try to convince you that it really is good (I put my hand up to stop him, convincing over this combo was something I did not need) and more likely than not he'll join you in downing the shots. 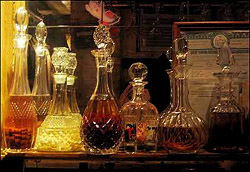 Other spots you can find the drink, known as a Pickle Back according to this article are Bushwick Country Club and Whiskey Town. 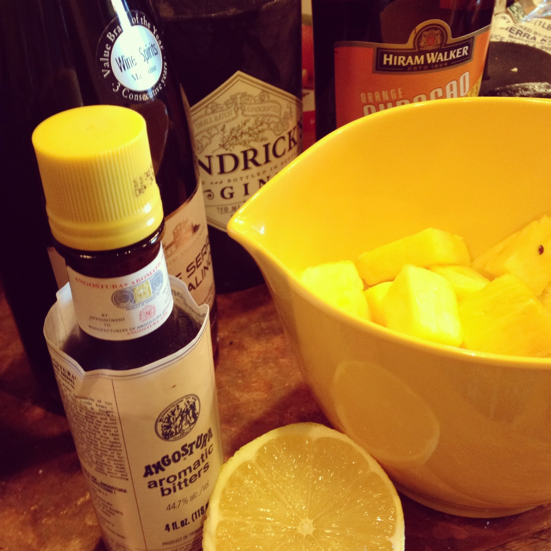 Fortunately, this is also a really easy drink to partake in for less dough at home. There are three places in the city I have been to that do it well: Anyway Cafe (151 2nd Ave.); The Russian Vodka Room (265 W. 52nd St.); Aquavit (65 E. 55th St.) and I've also heard that Savalas (285 Bedford Ave, Brooklyn) serves an Oreo infused vodka, I can't recommend it until I've tried it, but I'll keep you posted.